I honestly believe there are no coincidences for believers in God’s sovereignty, and that every event, every conversation, every relationship is part of the tapestry designed by God for us to become who we are, dedicated to His special purposes, and destined to fulfill His plan for each other at the very time and place where we are. We are to bloom where we are planted. Explore with me how each circumstance we’ve been in is part the most beautiful garden landscape ever imagined. Each event, each encounter, becomes part of the kaleidoscope of color, texture, and fragrance making our personal signature unique. With me, thank those who have nourished or directed your life with Bless You Bouquets along your garden pathways. Travel with me from New York, New Jersey, Florida, and Iowa to visit my gardens, meet my friends, experience joys, tears, lessons learned and bridges burned, and see why each person and experience graces my Memory Garden, and why these individuals deserve fresh Bless You Bouquets. The book contains short memoir pieces, poetry, blog entries, and short stories as garden interludes. With permission from the author, these may be used for classroom demonstrations and examples only. 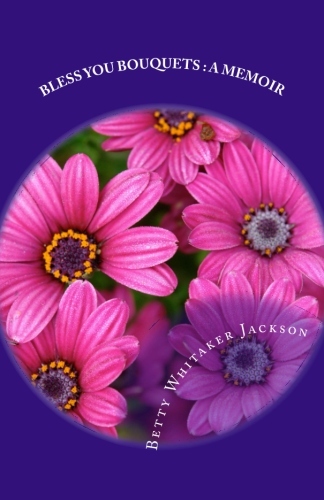 As a retired language arts teacher who understands great examples of good writing, this permission will be readily available by contacting the author at www.bettyjackson.net. Directions for creating actual Bless You Bouquets from your garden flowers appear at the beginning of the book. Also, material about the traditional meaning of flowers is provided.